As the iconic Kentucky Derby approaches, there’s no better time to refresh your mint knowledge and prepare for a thirst-quenching round of flavorful mint juleps. Make simple syrup by boiling sugar and water together for five minutes. Cool and place in a covered container with six or eight sprigs of fresh mint, then refrigerate overnight to allow the mint flavoring to infuse. Make one julep at a time by filling a julep cup with crushed ice, adding one tablespoon mint syrup and two ounces of Early Times Kentucky Whisky. Stir rapidly with a spoon to frost the outside of the cup. 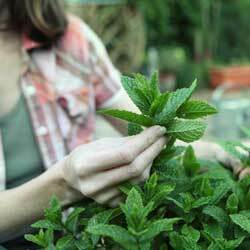 Want to add a personal touch to your mint juleps – or any other mint recipes – by growing your own spearmint? Nothing could be easier. However, there is one word of warning – containment. Mints quickly become invasive when left to their own devices so it is imperative to plant mint in a container or an area from which it can’t escape. Growing mint indoors is the ideal solution and ensures it is easily at hand whenever you have a recipe that calls for mint’s refreshing taste. Easily grown from seed scattered on a moist surface, mint also transplants easily from purchased pots or from a friend’s garden. It thrives in moist shady areas and grows to 3′ tall. A light application of compost or a well-balanced fertilizer improves the quality but be careful; too much adjustment can also affect the overall flavor of the mint. Harvesting is also easy. 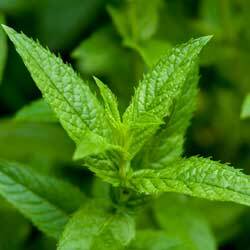 Whenever you want to use your mint, just wait until after the dew dries then cut the plant 3″ from the ground. Preserve by drying, freezing or storing in salt, sugar syrup, alcohol or oil. This method allows the mint oil’s distinctive taste and aroma to infuse the medium for future use. Aside from mint juleps, varieties of mints flavor a wide assortment of foods from salads to sauces and cookies to ice cream. 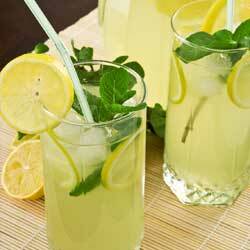 In the upcoming hot months, put spearmint in your lemonade (or beverage of choice). Of course, fresh mint has the strongest taste, so just pluck some, put it in a glass, and pour in the lemonade for a cool delightful thirst quencher with a sprig of freshness infused in every taste.